With the conclusion of today's media event to introduce the new iPad news publication The Daily, the application has now gone live in the App Store. 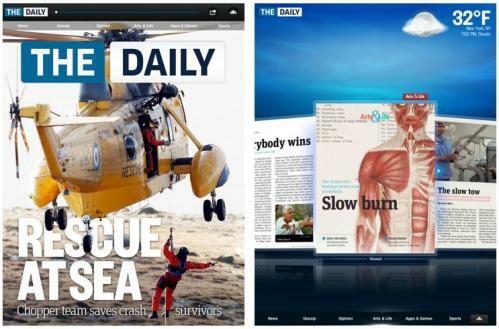 Introducing The Daily - the first digital news publication with original content created every day exclusively for the iPad. Built from scratch by a team of top journalists and designers, The Daily covers the world: breaking news, sports, pop culture, entertainment, apps, games, technology, opinion, celebrity gossip and more. The Daily has the depth and quality of a magazine but is delivered daily like a newspaper and updated in real-time like the web. Great stories, photos, video, audio and graphics come alive the more you touch, swipe, tap and explore. The customized sports section allows you to follow your favorite teams' scores, pictures, headlines - and even players' tweets. Those looking to download The Daily are being met with updated iTunes Store terms and conditions reflecting the addition of "In-App Subscriptions" as debuting in The Daily. After a free two-week period, subscriptions to The Daily will be available at $0.99 per week or $39.99 per year, automatically billed to users' iTunes Store accounts.